I’ve had a week of working with men and boys. Fathers and sons, it bring the topic of masculinity to my mind once again. I was on a 5 day compassion retreat with 5 men and 14 women. There was some real interesting talk about our experience of being men. The women said that this was really helpful getting an insight into the male mind. The woman then spoke about their experience of having to live and work with men. Then of course I am a father watching his sons, and a son who thinks of his own dad often. So, yeah masculinity has been prominent. It was fitting to read this tonight, and set me off writing down some of my observations, literature and experiences. Dad do you like me? Dad am I good enough? All sons seek to be men, but as they do – more than anything they need to hear that they are accepted, loved, and liked by their father’s – even if there are difficulties. Sons need to hear and know that they are more than the subject of dad’s disapproval, criticism, frustration, violence or exercise of power. 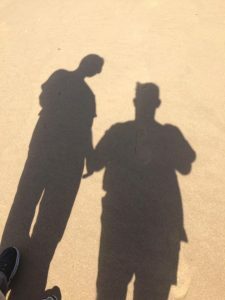 Sons need to feel their worth, not growing up feeling like an interruption or an irritant in the life of their dad – the first man that set the framework of what it is to be a man and the man who decides if they are worthy. At its best this is expressed as unconditional love so that the son can have the confidence to be himself. It also allows honesty to be spoken – “I love you but I find your behaviour difficult to tolerate or this is unacceptable”. We will all be pushed to our limits and beyond to breaking point by our children. But without this unconditional love a son and father relationship is always fraught with power relations and conflict, which are played out in each man’s relationship with other men and the next generations of boys. In the end, the roles reverse. As every father approaches death, he yearns to hear his son say – “you did a good job as a father” or “regardless of the difficulties, I still love you” (unconditional life). Until men start acknowledging and acting on this, men will continue to be trapped by their unapproving/critical/angry relationship with their father which ripples out to infect relationships with other men, women and children. Of course this is not to say that every son and father experiences this, and that is wonderful. However dysfunctional male relationships seems to be a common theme at the moment in my work and reading. Mindfulness can be an way of witnessing what drives our interactions with others. Learning to be present with silence, stillness and spaciousness can enable us to see the critical mind and the emotions causing us to engage with ourselves and others. If you can see this, and you develop kindness and compassion to yourself, you can make choices about how you would like to engage rather than automatically following old patterns created in childhood (sons and fathers). Be the change you wish to see in the world -and remember – Another world is possible.